Blurb Description: Gabby lives by two unbreakable rules: don’t expose her kind, the Sary, and don’t fall in love—too bad some rules are made to be broken. 1. For all those who haven't had the pleasure, elaborate a bit about the Sary Organisation- what they do, how they got here and whom they are headed by and any other bits of information! --Where to start! :) Okay, the Sary are the souls of those who died before taking their first breath and are therefore given the chance to come to earth to help those in need--mainly those who are thinking about committing suicide. It's a hard job and their leadership gives them assignments of who they should be helping. Sometimes they're able to get people out of their depression, and other times not. They're kind of like guardian angels, but also not totally (there's not a whole lot of religion in the books). They're facing troubled times during the books in my series--there are a lot of Sary that are interested in losing the secrecy they've always worked with, which is seen in Surrender the Sky, but comes to a head in book #4 :). 2. Talk to us a little about Surrender The Sky: the storyline, your heroine, her male counterpart and their common nemesis- just a little. to give readers an idea of the fun they're in for! --Let's see, really quick, Gabby is a Sary who loses her assignment, which is bad enough, but royally messes up when she accidentally lets everyone see her Sary form (think wings, and think big no-no!). Anyhow, the soon-to-be leader of the Sary, Jassen, shows up to ‘release’ her, but changes his mind...for certain reasons :) However, Gabby’s accident may possibly expose all of the Sary, due to the brother of a certain special person, whom Gabby has to stop. Hmm, not sure it totally does the book justice, but that's the gist of things! 3. How was your experience writing Surrender the Sky? Since the basis for the Sary has already found its roots in your head in your previous books, was it easier to write this stand alone? --Actually, this book was far easier. I already know this world so well it's kind of like visiting a favorite spot :) Also, I have already met Gabby and Jassen in other books, so putting everything together was mostly just a good time! 4. Do we get more Sary after this? (please, YES) or are you working on something new altogether?! Talk to us, your avid readers, about your journey to become a writer as well! 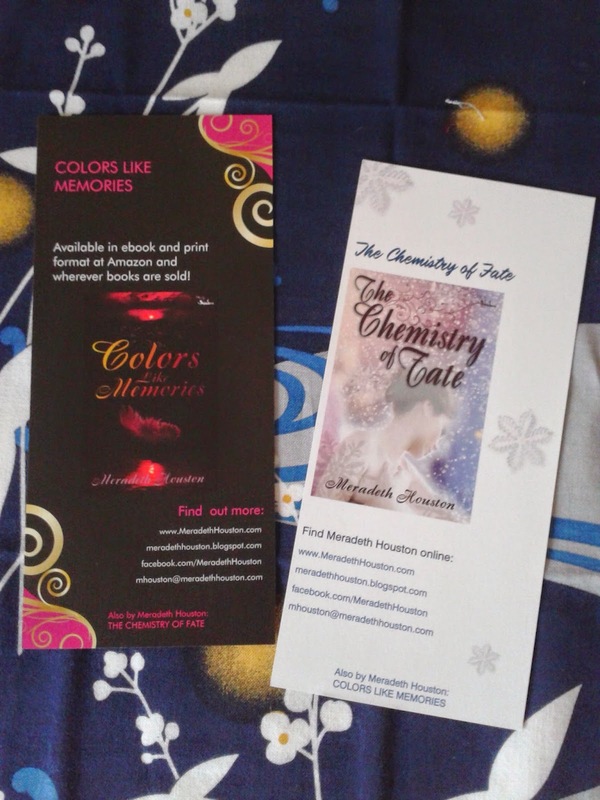 --I already hinted a bit about book #4, and I'm hoping that will be finished this summer (fingers crossed!). I also have a bunch of other projects in various levels of completion, mostly in the sci-fi realm of things. My journey to get here has been a long one, filled with lots of stumbling around, but also a lot of amazing people and a ton of learning. Even if at times I get really frustrated (ugh, querying new projects is never fun! ), I love to write! 5. We would love to know more about you- a few quick questions! Favorite Movie? --GATTACA. I think I've seen it at least 20 times. Favorite Song? --Anything by The Black Keys. Favorite Book? --No way I can pick just one! I do love A Wrinkle In Time quite a lot though. Favorite TV Show? --X-Files. I'm a re-run junkie on that show, at least the earlier episodes. Favorite Author? --Madeline L'Engle. And John Steinbeck. And Diana Gabaldon. Shoot, I could go on for ages! Favourite Character (from a book, of course!)? --Meg from A Wrinkle In Time, but there are far, far more! >She's a Northern California girl. This generally means she talks too fast and use "like" a lot. >She's been writing since she was 11 years old. It's her hobby, her passion, and she's so happy to get to share her work! If you haven’t read the interview or the blurb description already, the Sary are the souls of those who die before taking their first breaths. They are given a choice between being a Sary or just not existing anymore; fading away into the blackness that eventually consumes all. They are trained on an Island and their leader is referred to as the Teacher. Their main task is to, well, stop people from committing suicide and help them regain their happiness lost due to the tragedies of everyday human life. I love the concept of Guardian Angels who help people that are thinking about removing themselves from the world we know. Suicide is such a common thing these days and it just feels better to think that, at least in the book, people are receiving the help they crave, but don’t ask for. As if explaining the supernatural to people that don’t want to believe isn’t hard enough, Gabby also has to deal with rouge Sary, who believe that the Sary and all the miracles they make happen should be worshipped, not sworn to secrecy till the end of time. 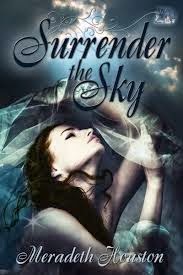 Surrender the Sky was a fun book! I thoroughly enjoyed it, from cover to cover! There were certain, points, however when I felt that our protagonist was being a bit whiny, with her ‘I am the Worst Sary Ever’ and her jaw dropping open at pretty much every time there was a twist in the tale (and there were many, unexpected twists, that is). I think I would have enjoyed the book a lot better if it were told from the rogue Sary perspective; it would have definitely been one of a kind! There were a lot of exceptionally written scenes, especially when the ones where Gabby and Jassen were flying off into paradise! They just increased the level of the book for me! A fun, light read that will make you smile and beg for more! I Loved. This. Book. 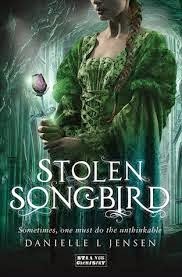 A perfectly executed, amazingly fun book with all the right ingredients, Stolen Songbird is officially my Favourite book yet of 2014! Taken from her home, her family, and the life she was promised she would have, Cécile de Troyes finds herself in an unknown world. One filled with wicked beauty, devious charm and intricately entwined splendor- Trollus- home of the trolls- trolls that are only whispered about in the tales children whisper to one another in the dead of night. Forced to be bonded to Trollus’ enigmatic, charming and calculating prince, Tristan, Cécile finds that everything that was once completely hers, is not anymore- not even her deepest emotions. And why? Because it was foretold, that it would be her and the Prince that would break the curse; the curse that has kept the trolls in confines for centuries. The curse that has kept them longing, waiting and hoping for the day when they can see the marvelous light of day again. While being a princess in one of the most cunning courts ever to exist is quite the contrary at to what Cécile has ever wanted, this Forbidden City and its Prince who are mythical to almost everyone who isn’t confined in it, grows on her with all of their splendor and wickedness alike. For in Trollus, Deception is a game, promises binding, power is the prize and Everybody’s playing! I won’t ruin this book for you, by explaining what happens, even though I can- but suffice to say that this book will make you open it again, the second you’ve flipped the last page! You’ll laugh at all the brilliantly thought out fake quarrels, almost fall of your seat every time something new comes along, wish and hope that you were living in Trollus at that very minute and of course, wait desperately for the next installment just like me! From a farm-girl to a princess, from a boy to a king, from magic to terror, from beauty to wickedness, from hatred to love, from foes to friends, this book will serve it all up on a Golden Platter! Just one more thing, what are you waiting for? Go ahead! I couldn’t give a stronger recommendation! 1. I believe that road trips, at any point in one’s life, is just something essential to experience- Could you tell us a little about your latest book, 16 Things I Thought Were True, for all those out there that haven’t yet had the pleasure? Sure! Here is a tidy little summary! 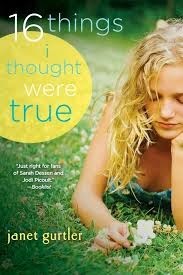 A Twitter-obsessed teen takes a road-trip and finds real friends who help her understand what is and is not true about family, friendship and love. 2. Could you sum up your three main protagonists- Morgan, Adam and Amy- in a couple of words each? Which one of them was your personal favourite to imagine and which one can you relate to the most? I loved all the characters, but Amy really stole my heart. I most relate to Morgan I think. When I was a teen I was kind of searching for who I was and didn’t always know who my real friends were. 3. Was writing 16 things any different from writing your other books? How so? Every book really is different to write. Some flow out really easily. This one was fairly easy to write. I could relate to Morgan and what she was going through and I knew what her journey was. I kind of struggled for a while about where the book was going to end up, but about half way through I had an epiphany and for me it really pulled the story together and made it make sense. 4. If you had to pick, what would be the best scene in 16 things- one that you would just love to live in? I loved the scene on the ferry when Amy and a little boy are whale watching. I have watched whales and I think it’s one of the most beautiful and peaceful things in the world. I’d love to go and do that again. 5. Tell us a little about what inspired you to write 16 things, your writing schedule (some time of day, or just how and where you go about it) and what made you start writing itself!? 16 Things kind of came to me as a What If. There’s so much social media now which is completely different from the world I grew up in. Teens especially have to learn how to deal with all of it. Figure out who they really are versus who they are in their online presence. So I thought, what if a girl was on a video that went viral online. How would she handle that? I wanted to show the irony that she hid out online, which was the place where she was overexposed. Writing is something I’ve always loved to do. 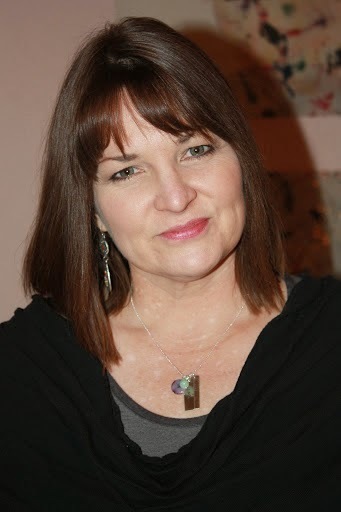 I wrote my first book when my son was a baby, and after that one, I kept going. 6.What and who were your favourite books and authors back in the day? What are you currently reading? I loved Judy Blume. My day was a while ago ha ha. As a teen I also loved books like Go Ask Alice and books by S. E. Hinton. Funny enough, my son is reading the Outsiders for school, and that is what I am reading now. It’s really interesting to me how popular that book remains and the way it is written. It’s brilliant, but different in many ways from today’s YA. 7.Any tales brewing in the back of your head we should look forward to? kitchen for the summer, she discover that sometimes the person who shouldn’t fit in your world is the one who makes you feel like you belong. I also have a mermaid MG series coming out in 2015 that I’m currently writing. 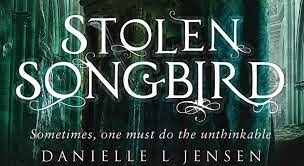 It’s so different from my realistic YA stories, but a lot of fun to write! 8.A small message to all of your fans and wannabe writers, please? I have a really hard time using the word fans. Fans are for people like Jennifer Lawrence or Christina Aguilera. I love that I have readers, and that’s what I call people who like my books. Readers for the win!!! My message for wannabe writers and readers is this…always be who you are. Be true to yourself. Amy is a great example to me of a person who okay with who she is, even if she doesn’t “fit the mold.” Same thing for writers. Figure out what you love to write. And write that. Read a lot. Write a lot. And be true to yourself! An Apple a day keeps the doctor away# things I thought were true. Meet Morgan McLean, the 18 year old girl with a perfectly normal life- well except with a father who abandoned her before she was even born (who her mother refuses to talk about), a best friend who posted a video of her dancing in her underwear on the internet, that went viral, an almost 5000 followers on twitter for her posts on #things I thought were true, and a mother who just wound up in the hospital, for a heart condition! And for her, life just couldn’t get any more humiliating. Until, her mother gives her the contact details of her father, Bob White, a last- minute- something when she thinks she is going to die from the surgery; a little piece of information that Morgan has waited all her life for! Road trips are cliché# things I thought were true. Now, Morgan just has to go meet the man who left her all those years ago, despite how he might hurt her even now. There is just one problem- he lives all the way in Canada. So, with her Nerdy (but cute) boss from the amusement park she works in, Adam, and the world’s biggest chatterbox, tell it like it is girl, Amy, she sets of on a journey that changes that course of her life as she knows it! But, should some secrets stay buried# things I thought were true. I really liked 16 Things I Thought Were True! It was a quick read on friendship, love, family, secrets, life and choices! I thought it would be a bit typical, but it was not. 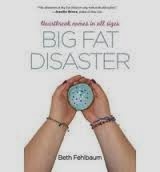 This is one of the few books I’ve read that shines some light to the advantages of social networking. It had a lot of elements, that I felt could have been explained a little better; some of the emotional scenes given more importance too but a good book all in all!- READ it!